The F-22 Raptor is an American fighter aircraft that utilizes stealth technology. The Raptor is an air superiority fighter, but is equipped for ground attack, electronic warfare, and signals intelligence roles as well. The United States Air Force considers the F-22 a critical component of the US strike force. The F-22 Raptor is claimed to be the most advanced air-to-air fighter aircraft currently in existence. In 1981, USAF developed a requirement for a new air superiority fighter intended to replace the capability of the F-15 Eagle. It was envisaged that the ATF would incorporate emerging technologies including advanced alloys and composite materials, advanced fly-by-wire flight control systems, higher power propulsion systems, and low-observable/stealth technology. Following a hard-fought fly-off competition, in August 1991 the YF-22 was declared the winner and Lockheed was awarded the contract to develop and build the Advanced Tactical Fighter. The first crash of a production F-22 occurred during takeoff at Nellis Air Force Base on 20 December 2004, in which the pilot ejected safely moments before impact. The crash investigation revealed that a brief interruption in power during an engine shutdown prior to flight caused a malfunction in the flight-control system; consequently the technical data for the aircraft has been amended to avoid a recurrence of this problem. A Lockheed Martin F-22 Raptor stealth fighter formatting with a Lockheed P-38 Lightning and a North American P-51D Mustang. which still holds open the possibility for new orders past that point. The total cost of the program by 2006 was $62 billion. The F-22 is not the most expensive aircraft aloft. That distinction likely belongs to the roughly $2.2 billion-per-unit B-2 Spirit, whose orders went from hundreds to a few dozen when the Cold War ended thus making the unit cost skyrocket, though the incremental cost was under US$1 billion, but also F-35 procurement, which was meant to be cheaper than the Raptors, became the most expensive program of all times. The F-22 uses fewer radar absorbent materials than the B-2 or F-117 Nighthawk, which is expected to translate into lower maintenance costs. On 31 July 2007, Lockheed Martin received a multiyear contract for 60 F-22s worth a total of US$7.31 billion. The contract brings the number of F-22s on order to 183 and extends production through 2011. During the recent grounding of nearly 700 F-15s, some U.S. Senators demanded that Deputy Secretary of Defense Gordon England release three government reports that support additional F-22 Raptors beyond the planned 183 jets. Forbes has reported that the USAF plans to extend the production of the F-22 past 2011. This is believed to be a response to the recent grounding of F-15A-D.
Several small design changes were made from the YF-22A prototype to the full-production type F-22A. The swept-back angle on the wing's leading edge was decreased from 48 degrees to 42 degrees, while the vertical stabilizer area was decreased 20%. To improve pilot visibility, the canopy was moved forward 7 inches (178 mm) and the engine intakes were moved rearward 14 inches (356 mm). The shape of the wing and stabilator trailing edges was refined to improve aerodynamics, strength, and stealth characteristics. Also, changes to improve stealth. The F-22 is a fifth-generation fighter that is considered a fourth-generation stealth aircraft by the US Air Force.There are a lot of classified information of the F-22, for example the top speed, which is probably a way faster than 1650 mph. Its dual afterburning Pratt & Whitney F119-PW-100 turbofans incorporate thrust vectoring, but in the pitch axis only, with a range of ±20 degrees. The engines boost like the airframe, the maneuverability and the stability of the plane ( how fast it enters stall). The maximum thrust is classified, though most sources place it at about 35,000 lbf (156 kN) per engine. Maximum speed, without external weapons, is estimated to be Mach 1.72 in supercruise mode; as demonstrated by General John P. Jumper, former U.S. Air Force Chief of Staff, when his Raptor exceeded Mach 1.7 without afterburners on 13 January 2005. With afterburners, it is "greater than Mach 2.0" (1,317 mph, 2,120 km/h), according to Lockheed Martin; however, the Raptor can easily exceed its design speed limits, particularly at low altitudes. Former Lockheed Raptor chief test pilot Paul Metz stated that the Raptor has a fixed inlet; but while the absence of variable intake ramps may theoretically make speeds greater than Mach 2.0 unreachable, there is no evidence to prove this. Such ramps would be used to prevent engine surge, but the intake itself may be designed to prevent this. Metz has also stated that the F-22 has a top speed greater than 1,600 mph (Mach 2.42) and its climb rate is faster than the F-15 Eagle due to advances in engine technology,even some of the pilots claim that the F-22 is already faster than the F-15. The F-15's thrust-to-weight ratio of about 1:1, with the F-22 having a ratio closer to 1:2.. The US Air Force claims that the F-22A cannot be matched by any known or projected fighter in WVR and BVR and in all other scenarios. The F-22 is extremely maneuverable, at both supersonic and subsonic speeds. The F-22's thrust vectoring nozzles allow the aircraft to turn very tightly, and perform extremely high alpha (angle of attack) maneuvers such as the Herbst maneuver (or J-turn), Pugachev's Cobra, and the Kulbit, though the J-Turn is more useful in combat. The F-22 is also capable of maintaining a constant angle of attack of over 70°, yet still having some control of roll. During June 2006 exercises in Alaska, F-22 pilots demonstrated that cruise altitude has a significant effect on combat performance, and routinely attributed their altitude advantage as a major factor in achieving an unblemished kill ratio. The F-22's avionics include BAE Systems E&IS (formerly Sanders Associates) radar warning receiver (RWR) AN/ALR-94, and the Northrop Grumman AN/APG-77 Active Electronically Scanned Array (AESA) radar which is able to track 1 m2 targets on 240 km, but this is always getting increased. The AN/APG-77 has about 2300 elements, more than any other fighter aircraft what makes it the the most capable radar in , with both long-range target acquisition and low probability of interception of its own signals by enemy aircraft. The radar’s information is processed by two Raytheon Common Integrated Processor (CIP)s. Each CIP operates at 10.5 billion instructions per second and has 300 megabytes of memory. Information can be gathered from the radar and other onboard and offboard systems, filtered by the CIP, and offered in easy-to-digest ways on several cockpit displays, enabling the pilot to remain on top of complicated situations. The Raptor’s software is composed of over 1.7 million lines of code, most of which concerns processing data from the radar. The radar has an estimated range of 125-150 miles, though planned upgrades will allow a range of 250 miles or more in narrow beams. The Raptor is designed to carry air-to-air missiles in internal bays to avoid disrupting its stealth capability. Launching missiles requires opening the weapons bay doors for less than a second, while the missiles are pushed clear of the airframe by hydraulic arms. The aircraft can also carry bombs such as the Joint Direct Attack Munition (JDAM) and the new Small-Diameter Bomb (SDB). The Raptor carries an M61A2 Vulcan 20 mm rotary cannon, also with a trap door, in the right wing root. The M61A2 is a last ditch weapon, and carries only 480 rounds; enough ammunition for approximately five seconds of sustained fire. Despite this, the F-22 has been able to use its gun in dogfighting without being detected, which can be necessary when missiles are depleted. As other air forces upgrade capabilities in the areas of air-to-air and air-to-ground munitions, one key aspect of the Raptor must be kept in mind. Its very high sustained cruise speeds, and operational altitude (something that is often ignored), add tremendously to the effective range of both air-to-air and air-to-ground munitions. Indeed, these factors could provide a strong rationale as to why the USAF has not pursued long-range, high-energy air-to-air missiles such as the MBDA Meteor. However the USAF plans to procure the AIM-120D AMRAAM, which will have a significant increase in range and maneuverability compared to the AIM-120C. The launch platform, in this case, provides the additional energy to the missile. This speed and altitude characteristic also helps improve the range of air-to-ground ordnance. While specific figures remain classified, it is expected that JDAMs employed by F-22s will have twice or more the effective range of munitions dropped by legacy platforms. In testing, a Raptor dropped a 1,000 lb (450 kg) JDAM from 50,000 feet (15,000 m), while cruising at Mach 1.5, striking a moving target 24 miles away. The SDB, as employed from the F-22, should see even greater increases in effective range, due to the improved lift to drag ratio of these weapons. While in its air-superiority configuration, the F-22 carries its weapons internally, though it is not limited to this option. The wings are capable of supporting four detachable hardpoints. Each hardpoint is theoretically capable of handling 5000 lbs of ordnance. However, use of external stores greatly compromises the F-22's stealth, and has a detrimental effect on maneuverability, speed, and range. As many as two of these hardpoints are "plumbed", allowing the usage of external fuel tanks. The hardpoints are detachable in flight allowing the fighter to regain its stealth once these external stores are exhausted. Currently, there is research being conducted to develop a stealth ordnance pod and hardpoints for it. Such a pod would comprise a stealth shape and carry its weapons internally, then would split open when launching a missile or dropping a bomb. Both the pod and hardpoints could be detached when no longer needed. This system would allow the F-22 to carry its maximum ordnance load while remaining stealthy, albeit at a loss of maneuverability. However, there is concern over this program as external carriage of fuel tanks has shown more stress placed on the wings than originally anticipated. The stealth of the F-22 is due to a combination of factors, including the overall shape of the aircraft, the use of radar absorbent material (RAM), and attention to detail such as hinges and pilot helmets that could provide a radar return. However, reduced radar cross section is only one of five facets that designers addressed to create a stealth design in the F-22. The F-22 has also been designed to disguise its infrared emissions to make it harder to detect by infrared homing ("heat seeking"), like on it´s concurrent the PAK-FA and surface-to-air or air-to-air missiles. Designers also addressed making the aircraft less visible to the naked eye, controlling radio transmissions, and noise abatement. The F-22 apparently relies less on maintenance-intensive radar absorbent material and coatings than previous stealth designs like the F-117. These materials caused deployment problems due to their susceptibility to adverse weather conditions. Unlike the B-2, which requires climate-controlled hangars, the F-22 can undergo repairs on the flight line or in a normal hangar. Furthermore, the F-22 has a warning system (called "Signature Assessment System" or "SAS") which presents warning indicators when routine wear-and-tear have degraded the aircraft's radar signature to the point of requiring more substantial repairs. The exact radar cross section of the F-22 remains classified but it is estimated to be 0.0001 square meters if not lower. Intended to be the leading American advanced tactical fighter in the early part of the 21st century, the Raptor is the world's most expensive fighter to date with an incremental cost of about US$138 million per unit. The number of aircraft to be built has dropped to 183, down from the initial requirement of 750. Part of the reason for the decrease in the requirement is that the F-35 Lightning II uses much of the technology used on the F-22, but at a much more affordable price. To a large extent the cost of these technologies is only lower for the F-35 because they have already been developed for the F-22. The YF-22 was a developmental aircraft that led to the F-22; however, there are significant differences between the YF-22 and the F-22. Relocation of cockpit, structural changes, and many other smaller changes exist between the two types. The two are sometimes confused in pictures, often at angles where it is difficult to see certain features. For example, there are some F-22 with pitot booms which some think are only found on the YF-22 (such as pictured at end of article). The YF-22 was originally given the unofficial name "Lightning II" by Lockheed, which persisted until the mid-1990s when the USAF officially named the aircraft "Raptor". For a short while, the aircraft was also dubbed "SuperStar" and "Rapier". The F-35 later received the Lightning II name on 7 July 2006. In 2006, the Raptor's development team, composed of Lockheed Martin and over 1,000 other companies, plus the United States Air Force, won the Collier Trophy, American aviation's most prestigious award. The U.S Air Force will acquire 183 F-22s which will be divided among seven squadrons. In 2007, tests carried out by Northrop Grumman, Lockheed Martin, and L-3 Communications enabled the AESA system of a Raptor to act like a WiFi access point, able to transmit data at 548 Megabit/sec and receive at Gigabit speed which is far faster than the current Link 16 system used by US and allied aircraft, which transfers data at just over 1 Megabit/sec. On 12 December 2007, the USAF officially declared the F-22 fully operational, three years after the first F-22 Raptor arrived at Langley Air Force Base. On 22 November 2007, F-22A Raptors of the 90th fighter squadron performed their first intercept of two Russian Tu-95MS 'Bear-H' bombers in Alaska. This was the first time that F-22s had been called to support a NORAD mission. In March 2013, an F-22 intercepted an Iranian F-4 Phantom off the Iranian coast, which got within a 16 mile radius of a MQ-1 Predator drone. Chief of Staff Gen. Mark Welsh described how the F-22 managed to check out the F-4's payload, while remaining completely undetected: "He flew under their aircraft to check out their weapons load without them knowing that he was there, and then pulled up on their left wing and then called them and said ‘you really ought to go home.'" In September 2014, several F-22s conducted their first air strikes over Syria. They were equipped with 1000lbs GBU-32 JDAMs, which were most likely used to attack highly sophisiticated Russian air defense systems, making the F-22's stealth a necessary requirement. Under the Navalized Advanced Tactical Fighter (NATF) program, a carrier-borne variant of the F-22 with swing-wings was proposed for the U.S. Navy to replace the Grumman F-14 Tomcat, though the program was subsequently cancelled in 1993. A two-seat F-22B trainer variant was planned, but was cut in 1996 to save development costs. Another more recent proposal is the FB-22 Strike Raptor, which would be used as a deep strike bomber for the USAF, but there has yet to be any word on whether the USAF plans further development of the program. Also, the X-44 MANTA, short for Multi-Axis, No-Tail Aircraft, is an experimental aircraft which itself is an F-22 with enhanced thrust vectoring controls and no aerodynamic backup (i.e. the aircraft is controlled solely by thrust vectoring, without rudders, ailerons, or elevators), is another example. Block 35 Automatic ground collision avoidance system and the multifunction advanced datalink will be added to allow the F-22 to transmit data to other stealth aircraft. 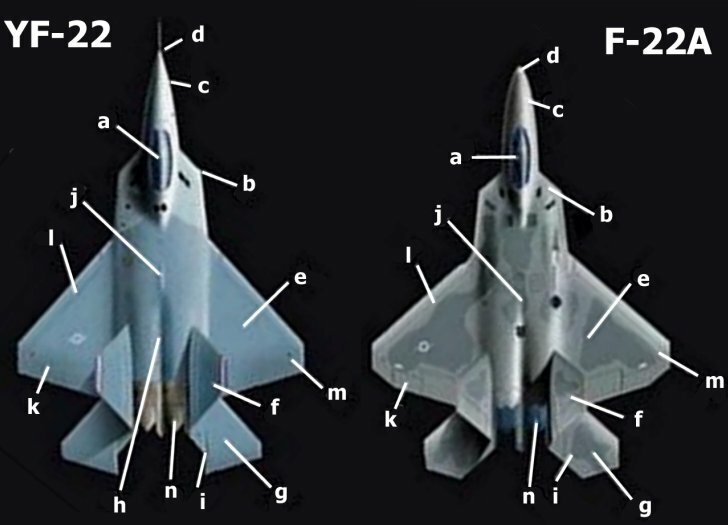 A comparison between the YF-22 and the F-22. Company involvement with producing the F-22. The original concept submissions be Lockheed, Boeing, and general Dynamics. An F-22 Raptor dumping flares. ↑ 1.0 1.1 "USAF F-22 Raptor fact sheet"
↑ Pike, J. "F-22 Raptor Flight Test." GlobalSecurity.org. ↑ 4.0 4.1 4.2 "Lockheed Martin Awarded Additional $5 Billion in Multiyear Contract to Build 60 F-22 Raptors", Lockheed Martin press release, 31 July 2007. ↑ U.S. Department of Defense contracts, 31 July 2007. ↑ "Senators demand more F-22 fighters", Yahoo news, 9 November 2007. ↑ "Pentagon Plans for more F-22s", Forbes, 7 December 2007. ↑ Bennet, J.T. "Air Force Plans to Sell F-22As to Allies." InsideDefense.com, 18 February 2006. ↑ Carmen, G. "Rapped in the Raptor: why Australia must have the best." The Age, 2 October 2006. ↑ Beazley, K.. "Media Statement." Australian Labor Party, 26 June 2006. ↑ Landers, K. "Australia to buy 100 Lockheed jet fighters." The World Today, 27 June 2006. ↑ Brogo, A. "A Big Deal: Australia's future air combat capability." Australian Strategic Policy Institute (Canberra) , 25 February 2004. p. 62. ↑ "Israel Plans to Buy Over 100 F-35s"
↑ Bruno, M. "Appropriators Approve F-22A Multiyear, But Not Foreign Sales." Aerospace Daily & Defense Report. 27 September 2006. ↑ Stewart, C. "US rules out deal on F-22 Raptor fighter jets." News.com.au. Access date: 14 February 2007. ↑ Carlson, Maj. Gen. Bruce. "Subject: Stealth Fighters." U.S. Department of Defense Office of the Assistant Secretary of Defense (Public Affairs) News Transcript. Access date: 16 July 2007. ↑ 19.0 19.1 19.2 19.3 19.4 19.5 19.6 Fulghum, D.A. and Fabey, M.J. "Turn and Burn." Aviation Week & Space Technology. 8 January 2007..
↑ Peron, L. R. "F-22 Initial High Angle-of-Attack Flight Results." Air Force Flight Test Center. (Abstract.). ↑ 21.0 21.1 21.2 21.3 21.4 21.5 21.6 21.7 Fulghum, D.A and Fabey, M.J. "F-22: Unseen and Lethal." Aviation Week & Space Technology. 8 January 2007. "Raptor Scores in Alaskan Exercise" (online edition). ↑ Klass, Philip J. "Sanders Will Give BAE Systems Dominant Role in Airborne EW." Aviation Week & Space TechnologyVolume 153, issue 5, 31 July 2000. p. 74. ↑ Sweetman, Bill. "Fighter EW: The next generation." Journal of Electronic Defense, Volume 23, issue 7, July 2000. p. 41-47. ↑ Pike, J. "F-22 Avionics." GlobalSecurity.org..
↑ 26.0 26.1 Philips, E.H. "The Electric Jet." Aviation Week & Space Technology. 5 February 2007. ↑ "USAF Almanac." Air Force Magazine. May 2006. ↑ "U.S. orders two dozen raptors for 2010." United Press International. 22 November 2006. ↑ 30.0 30.1 30.2 Fulghum, D.A. "Away Game." Aviation Week & Space Technology. 8 January 2007. ↑ US Budget for 2008. ↑ "U.S. To Declare F-22 Fighter Operational." Agence France-Presse. 15 December 2005..
↑ 37.0 37.1 "Tactical Aircraft: Concurrency in Development and Production of F-22 Aircraft Should Be Reduced." General Accounting Office. April, 1995. ↑ 38.0 38.1 "Tyndall AFB receives F-22 maintenance trainer." 325th Fighter Wing Public Affairs. 29 April 2006. ↑ "Hill begins modifications on F-22A Raptor." ↑ "F-22 Raptor Wins 2006 Collier Trophy." National Aeronautic Association. ↑ "F-22 excels at establishing air dominance", U.S. Air Force, June 23, 2006. ↑ "Lockheed's F-22 Raptor Gets Zapped by International Date Line." Daily Tech, 26 February 2007. .
↑ "US Air Force: Raptor Stealth Fighter Jet Fully Operational"
↑ "F-22s at Langley receive FOC status"
↑ Pace 1999, p. 28.